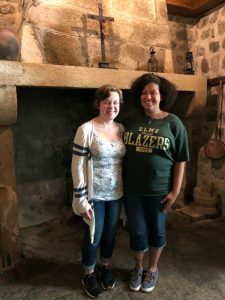 Two students from Elms College spent a week in France in June 2018, practicing their French, learning about French history and culture, and — perhaps most importantly — making personal connections with the legacy of the college’s founders, the Sisters of St. Joseph. 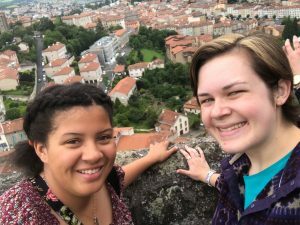 From June 16 through 23, Monica Karriem ’20 of West Hartford, CT, and Jane Dugan ’20 of Southwick, MA, joined a pilgrimage to Le Puy, France, led by the Association of Colleges of Sisters of St. Joseph (ACSSJ), of which Elms College is one of nine members. The group was led by Sr. Kitty Hanley, CSJ, Ph.D., and Sr. Joan Lescinski, CSJ, Ph.D., along with Martha Malinski, executive director of the Association of Colleges of Sisters of St. Joseph, and Campus Ministry representatives from some of the colleges. After a long trip to Europe over the weekend, the students spent Monday through Wednesday in Le Puy, and Thursday and Friday in Lyon, France, visiting historic sites related to the Sisters of St. Joseph in each place. The trip allowed today’s students to see the sites and walk the same earth as the first SSJs, and to connect profoundly with the stories and charism of the sisters in the place where they were founded. “Entering Mother St. John’s room and standing at her grave was such an emotional experience, and made me realize how lucky we were to have her survive the troubles she endured,” Dugan said. Dugan, a secondary education and history double major, is a member of the Justice and Peace Committee, Agape Latte, and Campus Ministry. She also is one of the college’s Fontbonne Scholars, a group of undergraduates who wish to explore the mission of the college and the charism of its founders. As a youngster growing up in Southwick, Dugan used to accompany her grandmother, Kathleen Dugan, to her job at Mont Marie, the SSJ motherhouse in Holyoke, MA. “I wanted to get to know the sisters in France because I’ve grown up with all the sisters here in Massachusetts,” Dugan said. Despite her familiarity with the sisters, she said the focus on SSJ history during the trip opened her eyes to their impact on the world. “I learned that the SSJs stemmed from several strong women, and that we need to embody them more,” she said. “Starting with the first six sisters and Mother St. John Fontbonne, these women defied their society and were able to make a true difference in their times. Karriem, a social work major and religious studies minor, serves on the advisory board for Campus Ministry and is a co-chair for the office’s Agape Latte series. She was inspired to apply for the trip through her relationship with Sr. Carol Allan, SSJ, director of Campus Ministry. Karriem had always wanted to visit France. When she learned she was one of the students chosen to participate in the summer 2018 pilgrimage, she was ecstatic. “It was like God gave me a way to go to France,” she said. Both students plan to carry the experience into their future careers. Karriem intends to hold the SSJs as an example in her social work career. “It has enhanced my Elms education and my religious education, and it will enhance my career as a social worker because I can give the SSJs as an example of persistence, and I can use their spirit to guide me through my helping of people,” she said. Dugan and Karriem are back home now, but they look back on their trip with fondness and gratitude. “Le Puy is a little town, but it has a big heart,” Karriem added. Elms College offers a wide range of opportunities to enhance your education with deep spiritual growth. Contact us for more information.